Enjoying all weathers in this expansion. What is it? An expansion adding weather and holidays to the base game. Loretta Hewitt had a truly wonderful New Year’s Eve. She hung festive lights all over the house, she shared New Year’s greetings with every passer-by, she made a resolution, and she watched the countdown to midnight on the television. Marring the celebrations slightly was the fact that she shared these joyful moments with the Grim Reaper because her cat, Mr Wiggles, had died while she was having a festive bath. Holidays come to The Sims 4 courtesy of the Seasons expansion. As with The Sims 3 expansion of the same name, Seasons aims to flesh out the world further by bringing a cycle of seasons which alter the in-game weather, temperature and so on. Accompanying these are seasonal activities. Some are tied to the calendar—Love Day, New Year’s Eve, Winterfest—and others, like making snow angels, are about taking advantage of the changes in weather. Harvestable garden plants will only bear fruit or flowers in particular seasons so those plants now have a rhythm to follow. Decorative flowers also go through a yearly cycle, although it’s not as dramatic in terms of how it looks. Relatedly, Seasons brings changes to the gardening career path. You can either pursue the flower arranging variant, converting inventories full of bluebells and crocuses into cold, hard Simoleans or become a brilliant botanist. Loretta has gone down the flower arranging route given she had already maxed out the gardening skill and was swimming in snapdragons. She has also bought a beehive and suffered a creepy Halloween-flavoured haunted gnome infestation. My other household has just celebrated Winterfest, which meant I festooned the building with Christmas trees, holiday garlands, piles of gifts and whatever else I could find in the festive item menu. The day itself was pretty cute. Dad, Justin Delgato, loves Winterfest so he was super excited to be sharing festive remarks with everyone. He also made a big turkey dinner for everyone to share together. I forgot to buy a big dining table so they shared the meal together in, uh, completely different rooms of the house. Presents were opened and the whole family gathered by the fireplace to wait for Father Winter to arrive. I had made them wait by the wrong fireplace so the family also enjoyed the traditional festive rush to the other room for his gifts. Turns out Father Winter is actually just one of the local elders who appears to have magic chimney powers for the day and then just pops round a bunch to socialise afterwards. You can definitely WooHoo with Father Winter, BTW. There was a holiday lull at the beginning of summer so I took advantage of the option to create my own holiday. It’s called the Day of Grudges and features such traditions as “airing grievances”, “drinking” and “fighting”. In other words, it’s pretty much like any holiday get together you might see on telly. I mixed cocktails, got into a fight with a teenager and shoved a schoolchild. I did also get struck by lightning but that was because the day happened to coincide with a thunderstorm weather variant rather than cosmic comeuppance. The pre-set holidays will probably wax and wane in their appeal for me. I couldn’t find a quick way to put every hand-placed decoration into my inventory after the day was over so decorating was a bit of a faff, and each year the tasks for a successful holiday are the same. After this review I’ll set the season length option to its maximum to allow for the longest periods of time between holidays. On a personal note, the gardening career developments are a lovely bonus because gardening is the hobby I tend to gravitate towards in the game. 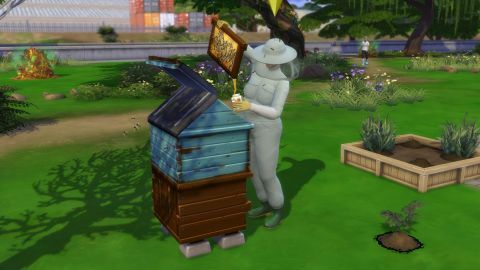 But, more generally, Seasons makes the world of The Sims 4 feel richer and more real. The events are useful for pushing you out of ruts in your playstyle and mixing up the day-to-day routine of your households. It’s the same price as the base game, but it’s worth it because it reinvigorates the whole prospect.